With Miracle Method’s continuing expansion, there are excellent opportunities for individuals who are interested in working for small companies with excellent growth potential. Average compensation equivalent to $12-$18 per hour. Compensation is typically commission-based which provides the opportunity to make more as you produce more. Some technicians can make much more than $18/hour. Full-time positions are available in many locations around the country. Inside work environment in baths and kitchens in homes, hotels, apartments, etc. Equal opportunity regardless of gender, race, age, etc. Men and women in good physical shape who can perform the tasks of refinishing. People who take pride in their work and who help Miracle Method continue to be the preferred refinisher in the industry. Miracle Method has the best technology and the best materials and equipment. We depend on our technicians to bring all those things together to deliver top quality work. Independent workers. 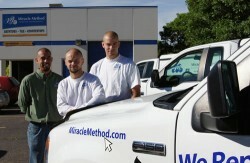 Our technicians work independently going to a different job site everyday. They must be able to start and finish each job by themselves. Good attention to detail. Refinishing is a craft. The quality of each job is only as good as the effort of the individual technician. Steps must be followed in order and a technician must have the patience and discipline to do the job right the first time. We need people willing to learn how to be the best. A clean Department of Motor Vehicles record. Auto-body or spray-paint experience preferred, but not required. Problem solvers. Each job is somewhat different and requires a person who can deal with the unexpected. If you are interested in a job with Miracle Method, please contact the local franchise. If positions are open, you can fill out an Employment Application. Click on Employment Application to request an application that you can fill out and deliver to the respective franchise location. Each Miracle Method franchise is independently owned and operated and sets and offers its own terms and conditions for employment. Thanks for your interest in joining the Miracle Method team.